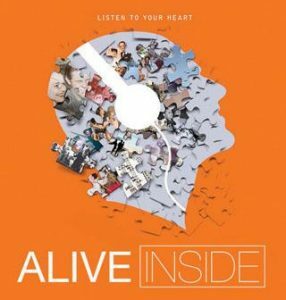 Genacross Lutheran Services and the Alzheimer’s Association, Northwest Ohio Chapter will present a benefit screening of the award-winning film “Alive Inside” on Thursday, September 28, 2017, at 7 p.m. at the Maumee Indoor Theatre, 601 Conant Street in Maumee, Ohio. This documentary by filmmaker Michael Rossato-Bennett demonstrates music’s ability to combat memory loss and restore a deep sense of self to those with dementia. The public screening is for caregivers, family members, and loved ones, but the emotional nature of the film is not for those personally facing the challenges of dementia. All proceeds will benefit the Music & MemorySM program at the Genacross Lutheran Services care campuses in Holland, Napoleon, Toledo and Sandusky, Ohio. Following the film, Lynn Ritter, PhD, Professional Education Coordinator for the Alzheimer’s Association, Northwest Ohio Chapter, will hold a question and answer session with the audience. Tickets are $5 and can be purchased at the Maumee Indoor Theatre or at the Genacross Lutheran Services-Wolf Creek Campus, 2001 Perrysburg Holland Road in Holland, Ohio. Tickets are free with a donated item, such as a new or used iPod/iPod shuffle, headphones/earbuds, or iTunes gift cards. Items can be donated at the Wolf Creek Campus or at the Maumee Indoor Theatre the night of the screening. Two Maumee restaurants, Dale’s Bar & Grill at 322 Conant Street and La Fiesta Restaurante at 1406 S. Reynolds Road, are donating a percentage of sales (25% and 15% respectively) from Monday, September 25, through Thursday, September 28. Restaurant patrons must show a benefit flyer or advertisement for Genacross to receive the percentage. For more information on the benefit screening of “Alive Inside,” call 419.340.7838. To download a benefit flier, click here.